Let me tell you about a New Year’s resolution from 1994 that I’ve managed (mostly) to keep. Late in December 1993, I was getting my new 1994 weekly calendar ready: writing in appointments, project deadlines, and birthdays, thinking about the year ahead, musing on what I wanted to do differently. I came to the realization I often wasted a tremendous amount of time and energy being really unhappy about many things that were usually out of my control, and honestly, not that important. … obsessing about the unkind remarks and unfair actions from others. … feeling terribly embarrassed and upset with myself after making even trivial mistakes. … letting fear of having my feelings hurt harm my relationships and connections. … picking on myself for the way I look, sound and how I carry myself. … reliving negative memories and feelings from the long ago past. belief in myself, or caring for others. As I worked to find ways to keep this resolution, I soon learned blind optimism – where I made promises that were impossible to keep – was NOT the solution to negativity. Nor did ignoring or suppressing strong feelings of negativity work, since they just kept leaking out in other ways. Instead I needed to find methods to transmute negative feelings into positive action. And I did! These lessons that I learned with the help of numerous wonderful people serve as the foundation for many of Kidpower’s emotional safety, boundary-setting, conflict resolution, and healthy relationship skills we teach. Download the poster for free! Accepting that we do NOT have to be perfect to be great. Not letting fear of disappointing others or of being disappointed ourselves rule our lives. Being persistent when things don’t immediately work well, instead of giving up and feeling badly about it. Recognizing hurtful or unsafe relationships, situations, and behavior, and protecting our feelings from those. Letting go of needing people to act a certain way or for things to happen the way we want in order to feel good about ourselves. 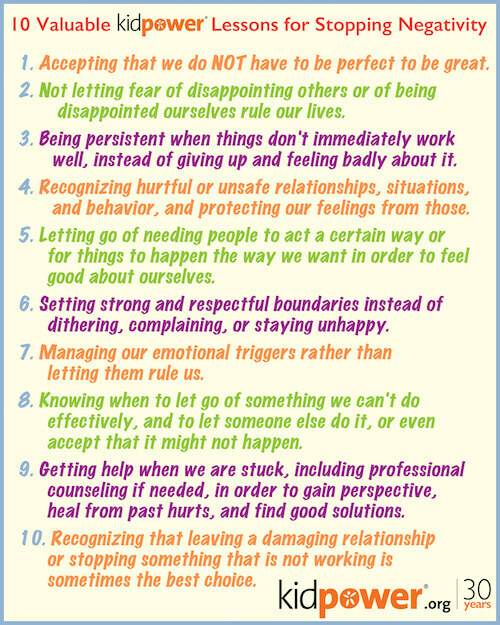 Setting strong and respectful boundaries instead of dithering, complaining, or staying unhappy. Managing our emotional triggers rather than letting them rule us. Knowing when to let go of something we can’t do effectively, and to let someone else do it, or even accept that it might not happen. Getting help when we are stuck, including professional counseling if needed, in order to gain perspective, heal from past hurts, and find good solutions. Recognizing that leaving a damaging relationship or stopping something that is not working is sometimes the best choice. I recognize that some situations are so upsetting that negative feelings can become overwhelming. However, letting the negativity continue can be counter-productive and often adds stress to an already difficult problem. Another lesson I learned was that creating a visual image for containing, transforming, or letting go of this negativity can help protect emotional health. For example, recently I had to deal with a very painful personal situation, I visualized sending my rage and sorrow up to the sun, and imagined my feelings adding enough energy for our sun to burn for an extra 100,000 years. Visualizing getting rid of my negative energy left me both feeling less stressed and being better able to do cope with subsequent things I needed to do. I confess that even though I make an ongoing practice of using these skills and strategies, occasionally I still find myself wasting time in useless negativity. The difference is that now I can recognize what is happening and do something about it sooner rather than later. I would love to hear about YOUR experiences in changing negative feelings into positive actions, as well as situations where you might feel stuck. Just email me safety@kidpower.org. As always, we will keep your name and details confidential unless you give specific permission to share them.